My answer to this question was: [I don’t think the crimes committed in the Americas, as well as in Africa, -including invasions, slaughter, colonization, exploitation, and slavery- were made by Spanish or even any Europeans. Otherwise, the economies of Spain and other European countries would had tremendous growth, but this is not what happened. On the contrary after the the Reconquista and expulsion and conversion of Jews in 1492 AD the colonization of the Americas began and at the same time the economies of the Iberian countries plummeted, while the Ottomans and the Jews in England prospered exponentially. Almost all Spaniards involved were actually “conversos” or labor. [Quora Moderation collapsed your answer for violating a policy on Quora. Quora Moderation collapsed your answer to “Is there any sense of shame in Spain about the mindless slaughter of native Americans in the colonial period?” for violating a policy on Quora. [Unfounded and false Blaming of Spaniards and Europeans for the mindless evil slaughter of native Americans in the colonial period is considered OK in your Moderation Policy and not violating the Quora’s “Be Nice, Be Respectful” policy! While stating the undeniable and documented facts of the role of Jews and Ottomans not only in the crimes committed in the Americas but also in the much worse and older crimes committed against Europeans as well as African are considered a violation to Quora’s “Be Nice, Be Respectful” policy! This is not a policy but it is disgusting political bias and an attack on history and truth. Your content was in violation of our Be Nice, Be Respectful policy. This core Quora principle requires that people treat other people on the site with civility, respect, and consideration. To learn more about this policy, please visit: https://www.quora.com/What-is-Quoras-Be-Nice-Be-Respectful-policy. More specifically, your content contained what we consider to be hate speech. Our decision is final, and your content will not be reinstated. If you see content that is objectionable, we suggest you either report or downvote it. You can report questions, answers, comments, and messages by clicking on the “Report” link which is located underneath the content. Pointing to the existence of Irish slavery is not hate speech! Pointing to the existence of European slavery is not hate speech! 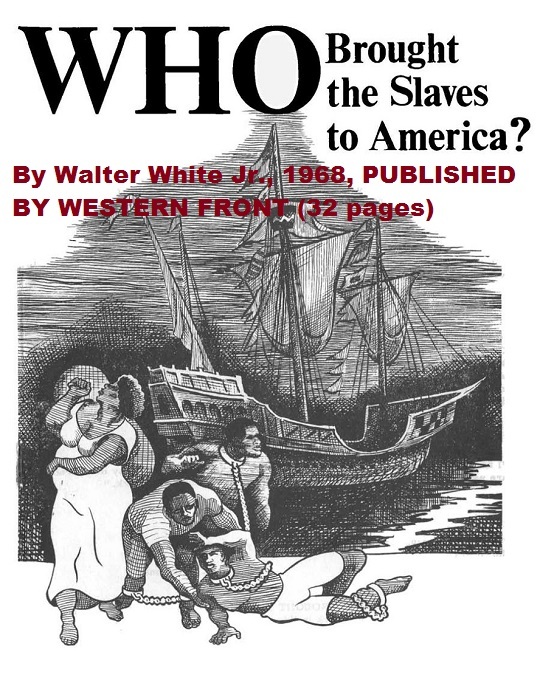 Showing the book Who Brought the Slaves to America – by Walter White Jr.is not hate speech! Accusing Europeans of slaughters and colonization of Americas and Africa IS HATE SPEECH. I am fed up with your corruption and bias; and I posted all your contacts and actions and I will remain faithful to truth. It is just history nothing more or less, labeling true history as hate speech or Antisemitism, although the Jews are definitely not Semite, totally different from Israelite, and above all the Jews are the only Antisemitic due to their persecution of Israelites and other Semites, is really disgusting corruption and bias. Europeans and the world must wake up and stop such falsifications. “Be nice. Be respectful.” Towards Jews, of course, but not to others, especially not to White folks. There is too much bias towards or in favor of Jews so that they can never be criticized or exposed for their crimes. Please erase the term “Whites” because is sums the Europeanized Turkic Mongolians to Europeans. It is only Europeans and light-skin Asians.